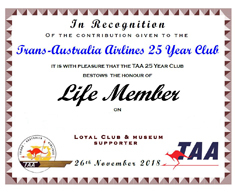 Lance joined TAA on the 30th September 1946. He was a junior clerk in the then Head Office at Charterhouse in Little Bourke Street. He used to drive the lift up and down for J Coles and L Bain, who were the bosses at the time. He was transferred to the booking office in the basement in Myers Lonsdale Street store. Later the booking office went to the IOOF building in Swanston Street. He was responsible , amongst other duties of organizing the boss's laundry. Then one day he lost the laundry and was so distraught, the men in the office had a collection for him to buy more clothes to replace the ones he had lost. The whip around was £37, but the replacement clothing did not cost anything like that so he made a handsome profit !. At this time he was overseen by a Miss Wooster, and Miss Mandel. He was sent to Essendon airport to see Geoff Bennett, who didn't really want him anyway. He stayed there and became Harry Machin and Ernie Thompson's office boy, in the aircraft overhaul. He had the title of technical clerk and as he had a way with words, wrote memo's for Ernie. Apprenticeships came along and he was put forward, which Gil Wise didn't like, as they had gone through a selection process which Lance skipped, so Gil didn't think much of him. He was the first TAA apprentice and although he wanted to be an instrument fitter and wear a white coat, he was told he was going to be an airframe fitter.! He served his 5 apprenticeship and within 1 year of finishing his apprenticeship he had obtained his first airframe licence, which was pretty good for 1 year out of his time. Then Gil thought he wasn't too bad after all! 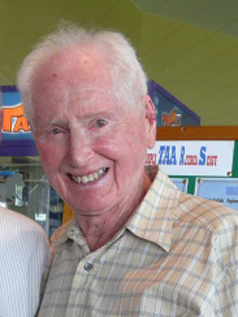 He served in the aircraft overhaul with Mick McDonald and Lloyd Haines as his bosses. Soon he became an acting leading hand which then became permanent. This lead to a senior leading hands position. At this time in the 1950's the Viscount aircraft were having their lower spar changes and the hand over from crew to crew was fraught with political intrigue! When the 2 crews went to 3 crews in the 1960's Lance became Foreman on crew 3 with Ray Tinker as his senior. In 1965 he went to Douglas Aircraft at Long Beach, in the USA, as the resident engineer on the DC9. He was there for a Year. Sometime after the move to Tullamarine in 1972, Lloyd Hains retired as the Dock Maintenance Supervisor (as Aircraft Overhaul was now called) and Lance was given the position. In 1980 he went to Toulouse on the A300 as the resident engineer for 6 months. On his return he moved over to the line maintenance Supervisors position, where he stayed for 5 years. In 1991 he had a gall bladder operation, which didn't go as planned and after some time in hospital, on his return to work, he was offered a golden handshake which he took. So ending his 45 year career with the airline. Some time later, during a conversation with Doc Brown who suggested a get together of retired TAA staff. This became the basis for the STAARS. It was thought about 50 or so would be in it and now it has grown to over 600 people on the books! A very fitting conclusion to a great career!